I love to let my readers know about good product, especially ones that can be used for more than just one thing. ( You know I'm all about saving storage space ) I came across this Techno Single Jet Flame Windproof Lighter and several uses came to mind. Sure it's a great lighter for a cigarette or cigar, but it can be used in the kitchen, use it to light candles, take it with you camping to light a lantern or campfire, etc. Being windproof, this will really come in handy for outside use. I know this lighter will get a lot of use in my house. It's well made, made with high quality materials for leak proof, long lasting use. 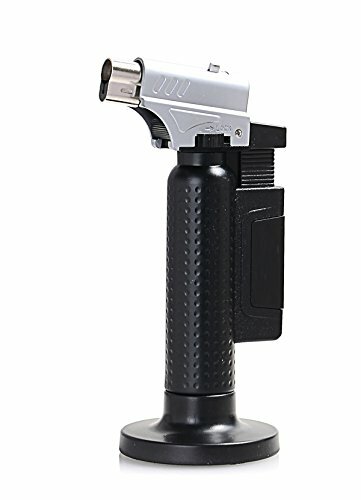 I like the slip proof material that's used on the handle, so especially if you're using it in the kitchen and your hands maybe a little damp, this lighter isn't going anywhere. The handle fits comfortably in your hand . This lighter is easy to refill using butane, and the flame is adjustable. Due to air mail regulations the lighter comes to you empty, so you will have to fill it before use.